Everybody loves a good pizza. At the same time, everybody loves receiving food in the comfort of their own home. With that in mind, Jet’s Pizza has set up a wonderfully convenient and satisfactory delivery system that operates in the areas around most of its locations. Apart from being convenient, Jet’s Pizza delivery is a flexible service that offers its customers a variety of options and opportunities. In order to let you know more about it, this guide will go over the most important characteristics and features of Jet’s Pizza delivery. Founded in 1978 in Sterling Heights, Michigan, Jet’s Pizza is a franchise restaurant that has steadily and surely gained the attention and trust of the American public. Its first franchise location was inaugurated in 1990. In the beginning, the company operated mainly in the Michigan region. In today’s world, Jet’s Pizza has 312 franchises and 24 company-owned locations in 20 different states. 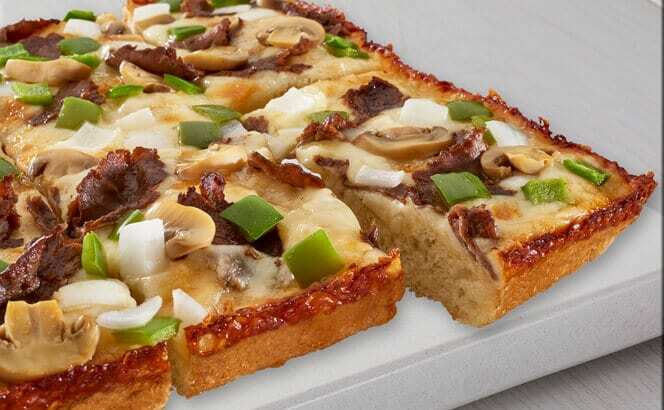 Known for its square deep-dish Detroit-style pizza, the brand has gained notoriety for its spirit of innovation and high-quality food items. In that vein, its trademarked eight-corner pizza is, to this day, one of the most recognizable food items in the region. In addition to pizza, Jet’s offers its customers other food items such as breadsticks, boneless chicken, and salads. In order to benefit its customers further, Jet’s Pizza has set up a delivery service that is both efficient and convenient. This service is available at most Jet’s Pizza locations in 20 states. In order to guarantee complete satisfaction, the restaurant franchise makes all deliveries itself. However, customers also have the opportunity to place orders for Jet’s Pizza food items through third parties such as DoorDash. 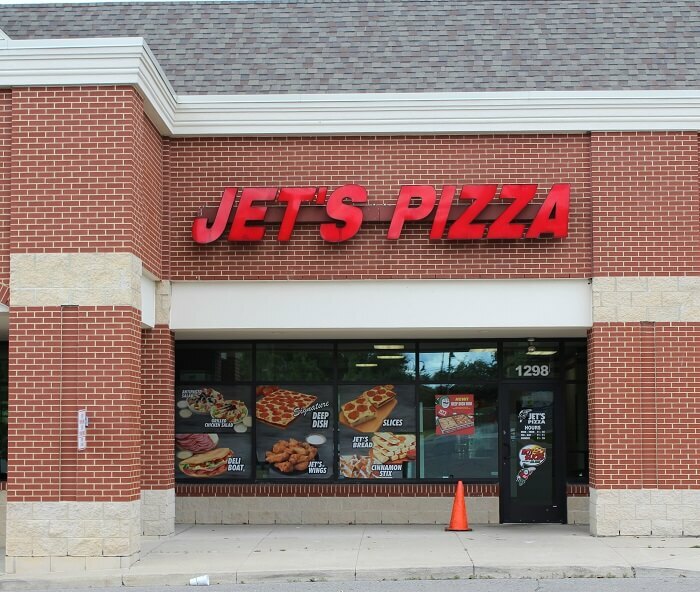 In order to help customers find the Jet’s Pizza store that is closest to them, the franchise has set up an online store locator. This locator allows potential customers to visualize every outlet that exists in their state. At the same time, it allows them to automatically find the store that’s closest to them by entering their Zip Code or address. With the intention of providing the best service possible to its customers, Jet’s Pizza is open seven days a week. In most locations, the hours of operation are between 10:00 AM and 10:00 PM. However, in order to be sure before making any plans, it is advisable to check their online website or make a call to the nearest store. In terms of the amount of time it takes the service to complete a delivery, the restaurant normally takes around 30 or 40 minutes for each order. However, this greatly depends on factors such as distance and the size of the order. At the time of writing this article, Jet’s Pizza has a standard delivery fee of $2.50. It may be important to note that this fee does not double as a tip. – Jet’s E-Club: In order to reward its most faithful customers, Jet’s Pizza has created the Jet’s E-Club. Entirely through the internet, members of the Jet’s E-Club will receive important information, special offers, and other incredible surprises. – Catering: Often, the hardest part of planning an event is coming up with a good menu that’s both enjoyable and practical. Luckily, Jet’s Pizza has a catering delivery service that is perfect for gatherings, meetings, and parties of all sizes. Apart from large pizza combinations, the service offers party trays of deep dish pizza, party salad bowls, chicken wings, and special breadsticks that include a variety of dipping sauces. – Jet’s Pizza gift cards: Jet’s Pizza also offers its customers the possibility of purchasing gift cards. Making a fantastic present for various special occasions, these gift cards can be personalized to include custom messages and designs. The gift cards arrive by standardized mail to locations in any of the states. Customers are able to choose between the type and value of the gift before making its purchase. It’s important to mention that Jet’s Pizza gift cards can be bought for a minimum of $15. – Store Locator: Without a doubt, one of the most useful features in Jet’s Pizza website is its Store Locator. As previously mentioned, this feature allows customers to find any Jet’s Pizza outlet that is closest to their home or office, making the ordering process much easier and convenient. After reading this article, many pizza lovers will be enthused by the wonderfully convenient characteristics of Jet’s Pizza home delivery. As is evident by its increasing popularity, the restaurant franchise has created an efficient and straightforward system. Rapid spreading across a huge portion of the United States, it clearly aims at reaching as many customers as possible nationwide. Without a doubt, Jet’s Pizza home delivery is a beneficial service that prioritizes the satisfaction of every customer. Have you tried it yet? If so, let us know about your experience in the comments! Hey Buddy!, I found this information for you: "Jet’s Pizza Delivery 101: Areas, Hours, Fees". Here is the website link: https://all2door.com/jets-pizza-delivery-101/. Thank you.